Another themed yearbook... We have watched as the school became international, then discovered computers - this year the emphasis chosen by the yearbook staff was the impact of the internet. Every section title begins with "w w w."
Now called Ankara School as it is comprised of all grades K-12, our alma mater made the news in several ways, but this story will touch all of us alumni. With enrollments at about half the number of students GCM has boasted in previous years, class sizes are small. 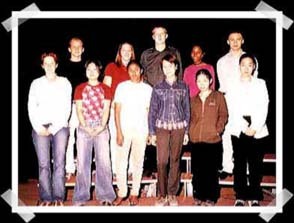 In fact, the Senior Class of 2001 had only 11 students. Faculty and administration work hard to keep its doors open by providing the highest quality "Leave It to Beaver" experience parents and students could want. They continue to provide a concrete reminder to DoDDS that quality education can and does trump enrollment numbers. I've reproduced the entire news section at 300dpi so you'll be able to read the whole story of the effort put forth by the staff and Principal Joe Robinson more easily. Don't miss the other pages in that section for even more ways AHS made news! I hope the administration will send prospective parents and students to e-Citadel to let them know what a strong impact attending school there continues to have on George C. Marshall graduates. Go-o-o, Trojans! The "big Ankara hugs" go out to the 2001 yearbook staff for working hard to produce this book for all of us, to Jing Liu, the artist who created the cover art for the book, and to Anita Donohoe '66 for donating this, one of a collection of eight yearbooks, to the e-Citadel project! Thank you all for giving us all back some fond memories of George C. Marshall life and times!